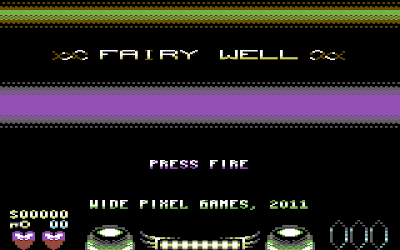 Fairy Well is a little gem of a game packed into a tiny 16KB cartridge. It is a modern example of the tight and efficient programming that was a hallmark of the 8-Bit era, where impressive game worlds were packed into tiny amounts of memory. 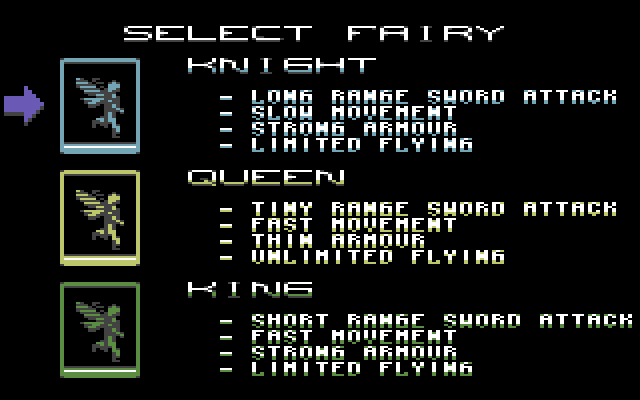 The theme also brings back nostalgic memories of playing Stormlord on the Spectrum, with it's search-and-rescue game-play focused on freeing fairy princesses held captive by a sinister Dark Wizard in a magical underground realm. 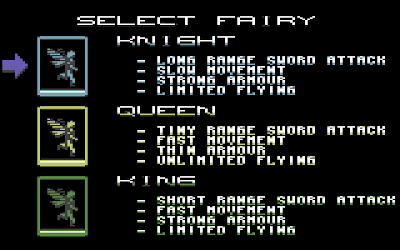 Taking control of the one-fairy rescue mission, you are given the choice of three fairy types with differing attributes at the start of the game: Knight, Queen and King. The fairy type you choose has a huge influence on the game-play, adding variety and increasing the longevity of its challenge. The Knight is tough and powerful, but is slow and can't fly for long without a rest. The King is faster but has limited firepower; the Queen is fragile but can fly fast without ever resting. To rescue the princesses you must break into their four mystical prisons, each located at the far end of an intricate and randomly-generated maze. Scattered across the maze are three crystals; you must find all three to break the magical seal and get inside the well to do battle with the Wizard. If you win the fight, the fairy princess will be spirited back to the forest – and you will collect the plaudits from the Fairy gentry. The action is flip-screen and viewed from the side, with the emphasis on exploration and collecting rather than fighting. Although there are plenty of opportunities to battle the denizens of the underground, and you can earn money by doing so, they can equally simply be avoided. It sounds simple but locating the crystals is anything but. They are randomly located in the maze so there are no clues as to their location and Sod's Law dictates that any route you decide to take will narrowly skirt around where our sparkly friends are hidden. The areas you have explored are recorded automatically on the in-game map; later on, you may find a map of the whole level. To make incisive progress you will need a helping hand, and this comes in the form of the Crystal Eye, which highlights the location of crystals on your map. The only trouble is, getting your fairy-soft mitts on a Crystal Eye is no doddle either. Like so many things in life, it all comes down to money: the Fairy Dollar, if you will. A piece of kit like a Crystal Eye will set you back a cool $3,800, so you'll need to do some serious exploration and treasure-hunting before you can afford one of those. Various items can be purchased at the many shop runes you will come across on your journey. You will certainly need to purchase a number of keys ($80) and at times extra health ($450), so you will quickly have to start accumulating wealth to make your quest a success. Thankfully, the caves are full of valuables which are locked away in the numerous chests you will encounter. You must collect or buy keys and help yourself to the treasure: gold, silver and bronze coins; rubies, daisy chains (like gold dust to fairies) and fairy cakes (ditto). Each chest contains one of the above, or a power-up like a shield or additional energy. If you are seriously unlucky, it will be empty – or if you are seriously lucky you might find a complete map or the coveted Crystal Eye. 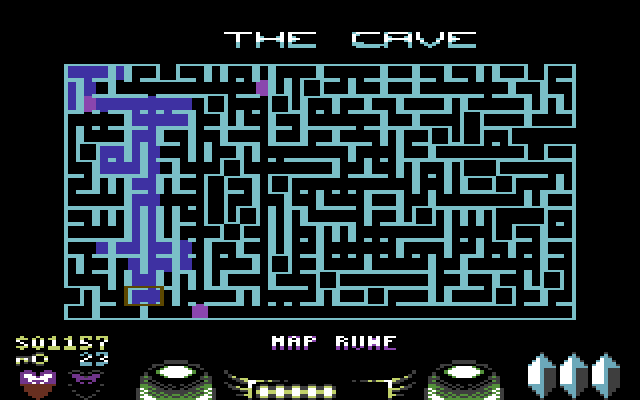 As the map of each level is randomly generated every time you play, the only given is that your fairy will start at the top left of the maze, and the well will be in the bottom right. The rest is completely different, which means you can come back to the game again and again. To thwart your quest, there are a wide variety of nasties inhabiting the underground. Most sinister among them are skull-like floating Predators that whizz around in a circle. You will also encounter a weird assembly of dangers from toxic toads, to crabs that spit venomous bile, to cursed stone doors that will crush your fairy, to, erm, drops of water from the cave roof (some fairies are not very tough). 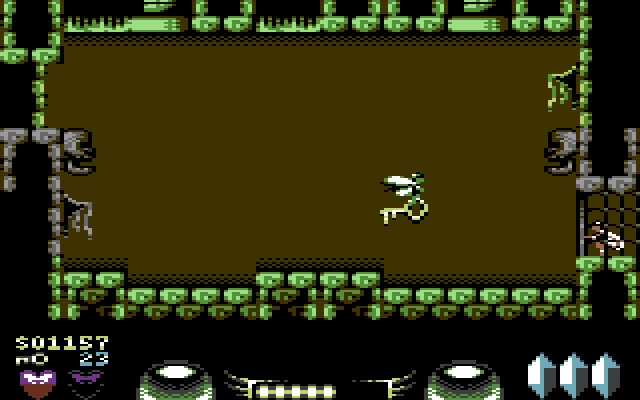 The majority of the dangers are relatively easy to avoid or destroy if you remain alert – but even if you kill them they will re-appear if you leave the screen and return (in classic retro-style). 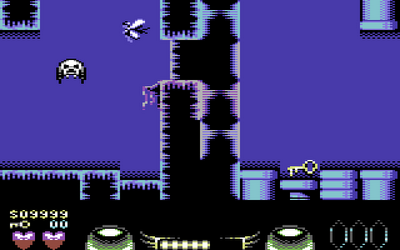 The game becomes more difficult when you reach the final Dungeons level and encounter the Seekers – indestructible floating orbs of energy that home in on your fairy, forcing you to move quickly or get fried. 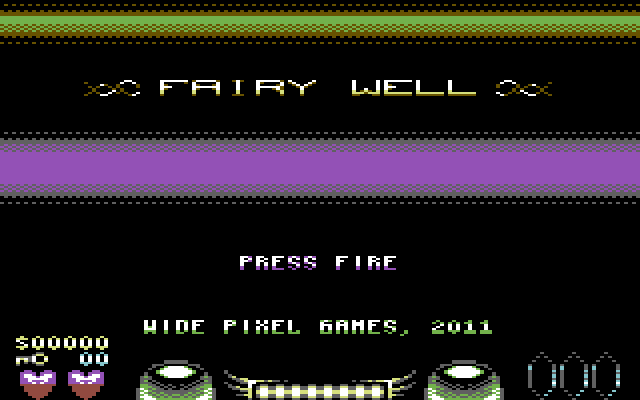 Fairy Well is an extremely playable game with a great look and feel and a slightly ethereal soundtrack of which the fairy kingdom would no doubt approve. Your fairy really looks the part and is effectively brought to life by simple animation of its wings. Each level is huge and presents a new challenge every time you play, further enhanced by the choice of King, Queen or Knight, which all require a different approach to the game to win. The random nature of the game does mean that occasionally you might find all three crystals straight away – but that's rare enough to be a nice surprise rather than a problem. Most of the time you need a good 20 minutes to explore, obtain the Crystal Eye, and collect the three crystals to complete a level. 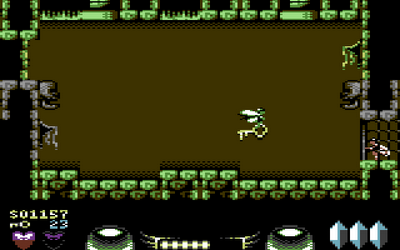 Considering the tight memory limitations imposed, it is impressive that each level ends with a boss to fight, although they are for the most part rather easy to beat. One criticism of the game is that most of the enemies and dangers are quite easy to avoid (apart from those blasted seekers)! This is balanced by the large size of the random levels that ensures that exploration is the main challenge and the game stands up to repeated playing. The map, which you can access at any time, is a fantastic and well-designed feature. In fact, the game would be nigh-on impossible without it! I whole-heartedly recommend this game and I would love to see what the developers could achieve if they were to utilise the additional storage space offered by a larger cartridge or disk. The game is available to buy on cartridge from RGCD for £20/21, or free to download. 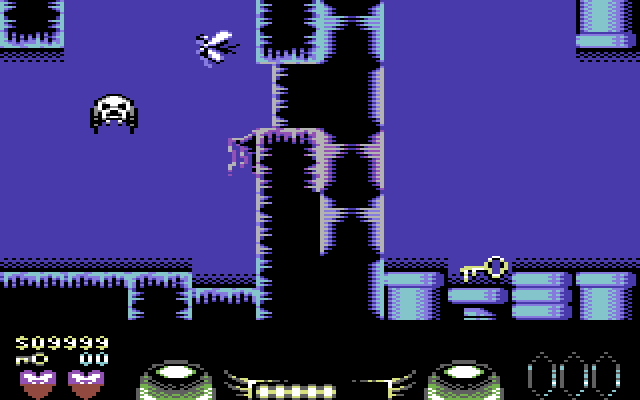 Buy the game here (on C64 cartridge from RGCD). Download the game for free here (from the Commodore Scene Database). Excellent game in a excellent cartridge box !!!! This literally blew me off. It's nothing short of amazing and deserves every bit of praise it's getting and will get in the future. Awesome.